Intrude, the highly acclaimed public art installation by Australian artist Amanda Parer, is one of the most celebrated and widely viewed pieces of light sculpture ever created. 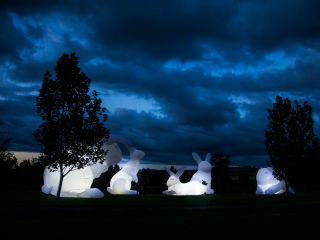 Intrude features seven monumental sculptural rabbits, each sewn in white nylon, inflated and internally lit. The installation includes the original five rabbits, plus two supersized rabbits over two stories high that were commissioned by Arts Brookfield for this tour.